In 2012, Sigma Gamma Rho Sorority Inc. conducted a survey of 3,200 black women in its organization. The organization did this to get a pulse on why, apparently, African-American women choose not to swim. At the time, a member of the sorority worked as a diversity officer with USA Swimming, the governing body of competitive swimming in the United States, and based on the alarming statistics surrounding African-Americans and swimming, she wanted to find a way to get more black mothers into the pool. The results are what we’ve come to expect at the intersection of some black people and swimming pools: fear, body image and cost. The black women they surveyed had near-drowning experiences in their past, were concerned about how they looked in bathing suits and the maintenance of their hair and could simply not afford to learn the skill. “We … found that if, say, a sorority member was not swimming, their child, grandchild was more likely not to do swimming as well,” said Secenario Jones, assistant to the director of the sorority’s southeastern region, who serves as the official swimming liaison for the sorority. Now was the time for the 93-year-old sorority to get involved in the community in a different manner: through water. After combing through the discouraging results, Sigma Gamma Rho and its international president at the time, Joann Loveless, decided now was the time for the 93-year-old sorority to get involved in the community in a different manner: through water. 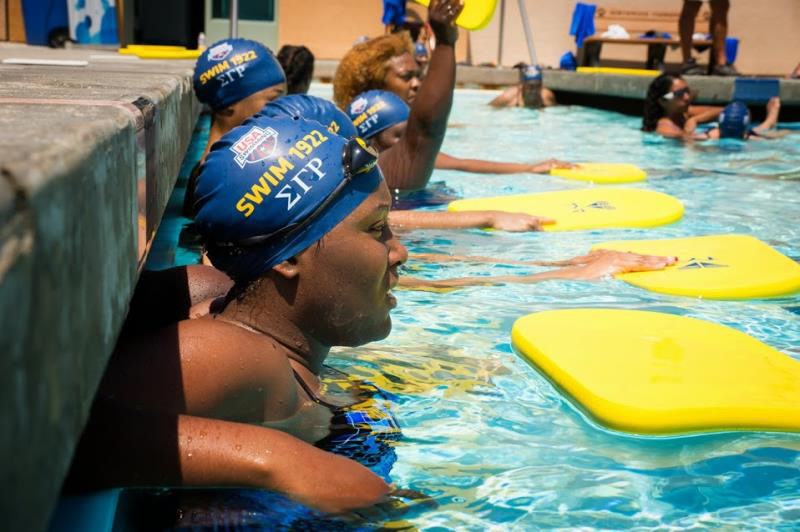 On July 16, 2012, Sigma Gamma Rho and USA Swimming launched a nationwide partnership to help encourage black participation in swimming and decrease drowning rates among African-Americans through local programming. African-American children in the United States are nearly three times more likely to drown than white children. “Our new partnership with USA Swimming is a perfect fit within Sigma Gamma Rho’s ongoing efforts to safeguard our youth through our Project Reassurance umbrella theme of Healthy Choices, Healthy Living, Healthy Generations,” Loveless said at the time. Sigma Gamma Rho is the first of the National Pan-Hellenic Council, a collaborative organization of nine historically African-American, international Greek-lettered fraternities and sororities, to add swimming to its national platform. The women of Sigma Gamma Rho wade at the edge of the pool during an exclusive swim clinic at the Phillips 66 Swimming Nationals on Aug. 9, 2014, at Northwood High School in Irvine, California. During the early stages of the agreement, sorority members volunteered as timers and officials at swim meets — including the acclaimed Black Heritage Championship Swim Meet in Cary, North Carolina — and clinics sponsored by USA Swimming and mobile carrier AT&T in an effort to sign up members and their kids for swimming lessons. Since the announcement, the partnership, named for the year the sorority was founded, has led to hundreds of free lessons, clinics, programming and community events that have helped thousands learn how to swim. The Swim 1922 Regional Contest was also created, a program intended to increase participation within regional chapters of the sorority. In 2015, Sigma Gamma Rho and USA Swimming extended their partnership after a successful three-year run, adding university campus events and K-12 workshops to the platform. “Sigma Gamma Rho has embraced the objectives to make this one of the most impactful partnerships we’ve done at USA Swimming,” USA Swimming executive director Chuck Wielgus said at the time. Last year alone, Sigma Gamma Rho hosted 72 events throughout the country, including free swim clinics, celebrity guests and access to national swim meets. A USA Swimming rep added that Sigma Gamma Rho “logged in 729 hours of community service hours related to swimming, with 1,959 swim lessons completed and 480,551 laps swam” last year as well. To help bring “credibility” to the organization’s programming, Sigma Gamma Rho reached out to one of its most famous members … who just so happens to be a trailblazer in the sport. McClendon, who’s now a senior marketing manager at a children’s clothing company, grew up swimming in Puerto Rico and understands the importance of having the skill. 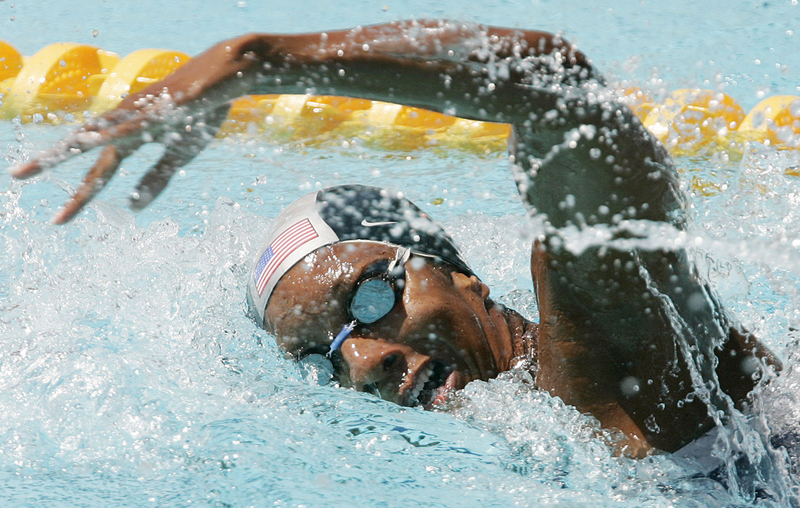 Maritza McClendon of the United States swims a leg in a heat of the 4×100 freestyle relay at the Olympic Games in Athens, Greece, on Aug. 14, 2004. But for those who heed that advice, live in an area close to a pool and pay for general access to the pool (and the required equipment), there’s another hurdle awaiting would-be swimmers at the pool deck. Swim lessons can be rather pricey. Jones estimates that it takes about $120 to learn how to swim, but that cost is based on how many lessons the average child might need. Most instructors charge by the session, which, at a YMCA in Tennessee for example, could range from $20 to $80 per session. “Not everyone is a member of a Y or have community pools in their area,” Jones said. To help alleviate that barrier, and combat the lack of diversity in pools, Sigma Gamma Rho uses its position to leverage foundations into adding resources to local communities and the organization hopes to create its own swim meets in the future. It also plans to one day sponsor future swim prodigies: the next Cullen Jones, Simone Manuel or Lia Neal, the latter two who are competing in the Rio de Janeiro Olympics this week. To do that, it’ll need to start at the undergraduate level, fostering the organizational skills necessary to continue the growth of the program and partnership with USA Swimming. Through workshops and symposiums, most recently at last month’s biannual conference in Cleveland, Sigma Gamma Rho emphasizes a curriculum aimed at growing involvement in the partnership, hosting programs across the 500 nationwide chapters and teaching water safety education to the young girls — named “Rhoers” — in its affiliate mentorship program. When McClendon started with Swim 1922 three years ago, she was constantly told by women that they never thought they’d learn how to swim, some even calling her crazy (the boys just didn’t want to wear Speedos), but they’ve since acquiesced. “Now, I can’t walk two feet without hearing a story of how water and Swim 1922 has impacted [someone’s] life,” McClendon said.